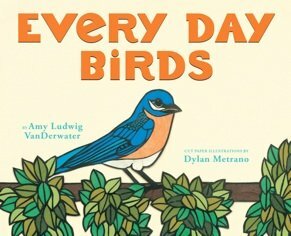 In Every Day Birds, rhyming text and cut paper illustrations make up this nonfiction picture book for the youngest bird enthusiasts. 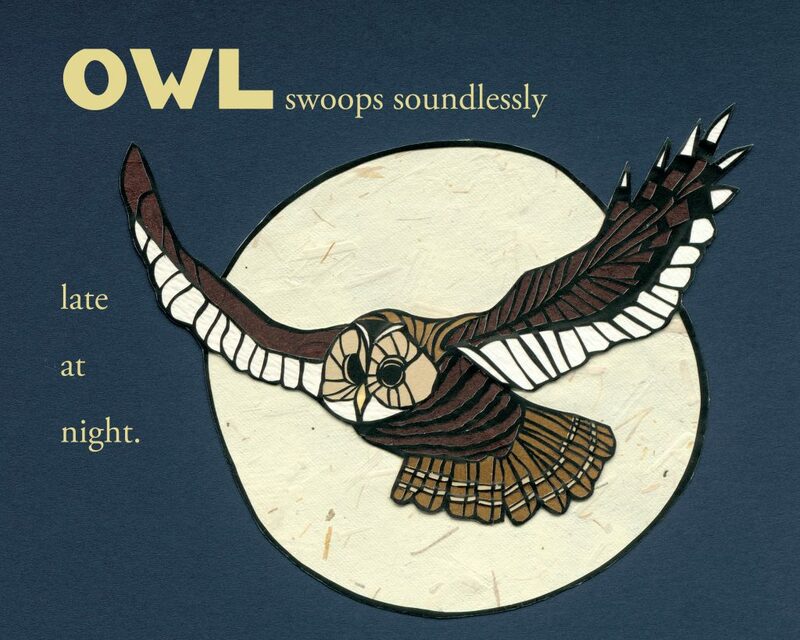 Twenty common North American birds are featured, one on each page, along with a simple fact. Featured birds include: the bluebird, the cardinal, the crow, the hummingbird, the robin, the sparrow, and more. Additional information can be found about each bird in the back of the book, along with an author’s note. Both the author and the illustrator do an exceptional job bringing the birds we see every day to life in the pages of this book. VanDerwater’s deceptively simple, rhyming text flows brilliantly from page to page. Metrano’s extraordinary layered cut paper illustrations bring each bird to the reader for a closer look. The art is colorful and full of detail, and is reminiscent of stained glass. Interesting textures abound throughout. Text from Every Day Birds written by Amy Ludwig Vanderwater. Illustrations copyright 2016 by Dylan Metrano. Used with permission from Orchard Books/Scholastic. In my opinion, you can never have too many bird books. Birds are a fascinating subject for young readers, so many shapes and sizes and, let’s not forget, the plethora of brilliant plumage colors. Though it’s important to introduce children to animals they may never see in person, it’s just as important to offer them more information about the birds they see every day in their own neighborhoods. Every Day Birds will help children develop a better understanding of and appreciation for the birds in their backyards. My copy of Every Day Birds was an ARC and was obtained by a colleague who attended ALA, Boston. The final product may differ slightly. The publication date for Every Day Birds was February 23, 2016. Guest reviewer, Lauri Fortino, wrote the picture book The Peddler’s Bed reviewed on Good Reads With Ronna here.